We’re proud to announce that Arigon Starr was the second place winner in the Painting/Drawing/Graphics/Illustration Category at this year’s Southwest Indian Arts Association Market, also known as Santa Fe Indian Art Market. This was the first time Arigon had submitted her work as an artist and her first time showing at the long-running Native arts event. 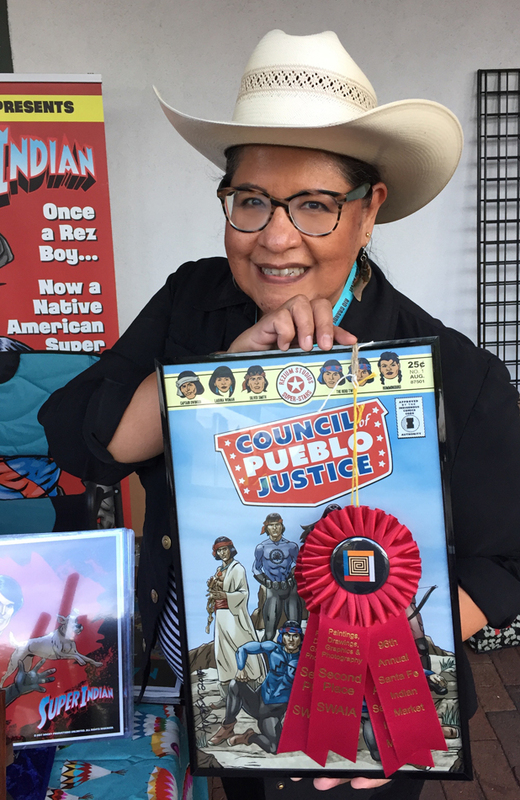 Arigon’s work, “Council of Pueblo Justice” is part of the upcoming “Super Indian Volume Three,” in a story featuring Laguna Woman. You might remember Laguna Woman from Volume Two, where she and Super Indian fought the vicious vampire Blud K’wan’Tum. The Council of Pueblo Justice also appeared in Volume Two, where they reminded Laguna Woman she wasn’t the ONLY superhero on the block! Recently, the blog “Hello Giggles” did a wrap up of some of the amazing Native women who showed their work at Indian Market. Arigon definitely made the list — and we’re sure it won’t be the last time. Here’s a link to the article.